haha oh! No I can't They're the same value ranges that 4.2 used which isn't in itself a problem, but being able to tell a 1.2 ohm resistor from a 1.8 ohm resistor (each with 5% tolerance) would be impossible. One would be 4.991V and the other would be 4.994V, both of which would be more than the 3.3V microcontroller could read. If you take those and solder them to the correct parts then you can use them! Because adding 1.2 ohms to 1200 ohms makes no difference. Sorry about the mixup. However, looking at the device while in a case with a USB wifi adapter inserted, looks like the then the wifi adapter wouldn't bottom out before coming in contact with the plastic. That would mean it could be pushed too far which would break the pillars. 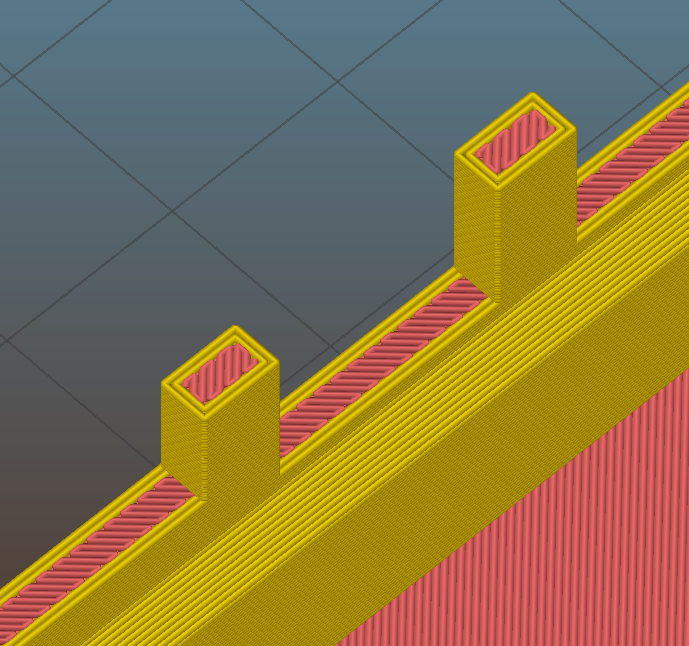 I looked again at trying to get a rib on the pillars but looking at how it is currently, I just don't think I'd be able to fit anything large enough to be filled by a 3D printer with an extrusion width over 0.5mm. I'll try to work that in though just to see, but I just spent a few minutes pushing on my pillars and they're really sturdy for being as tiny and as printed-in-the-wrong-direction as they are. I'd go back to asking if they are filled solid by your slicer as they need to be. I'm looking at having a HM 4.3.3 built. I've just ordered a kit for the time being, but I was considering sourcing the parts myself. Just something I noticed, but is some of the info wrong on the github 4.3 hardware list (https://github.com/CapnBry/HeaterMet...r-4.3-Hardware), for the quantities. For example, on the LCD button board, it says 'Buttons - TACTILE-12MM', quantity 1, shouldn't that be quantity 4? Then again 'LCD, LCD1M, LCD2M - PINHD-1X16, 1X5 M' it lists quantity as 1, when it should be 3? Maybe I'm just not reading it properly, but that's what it came across to me when I was reading it. Just for ss and giggles, I took a look at the case where WBegg noted an issue of breaking and it took very little force on my print also. Only the middle post broke, the other two seems pretty good. The middle post broke when pressing in and not pressing outward. I printed from the STL directly and did not make any changes to Simplify3d and it had had "fill" not solid. You're right about the buttons, it should be quantity 4 (S1, S2, S3, S4), fixed. The male pin header, the link is for 1 36-pin strip. You need 1x 16 pin section and 2x 5 pin sections that can be broken off from this same strip. It might seem counter-intuitive but it might even be worthwhile to reduce the wall thickness of the model in your case. It being hollow reduces the strength even though it is overall thicker. If you take the stl model's walls down to 2.4mm overall then you'd get solid fill at 3 shells / 0.4mm width which might end up stronger. I'm printing another case with 2mm thick x 2mm wide reinforcement strips on the back side of the pillars. 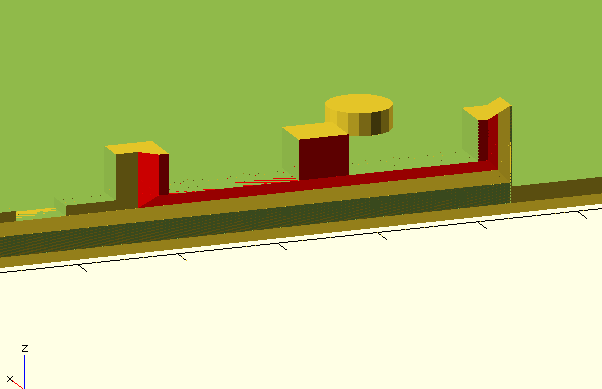 For my nozzle width (0.6mm / 0.72mm width) Slic3r shows them as being unfilled, as it can only fit one shell in the space. I'm concerned this could weaken my posts because now mine will be partially hollow but the additional width might make up for it and make it stronger on printers with small nozzles. 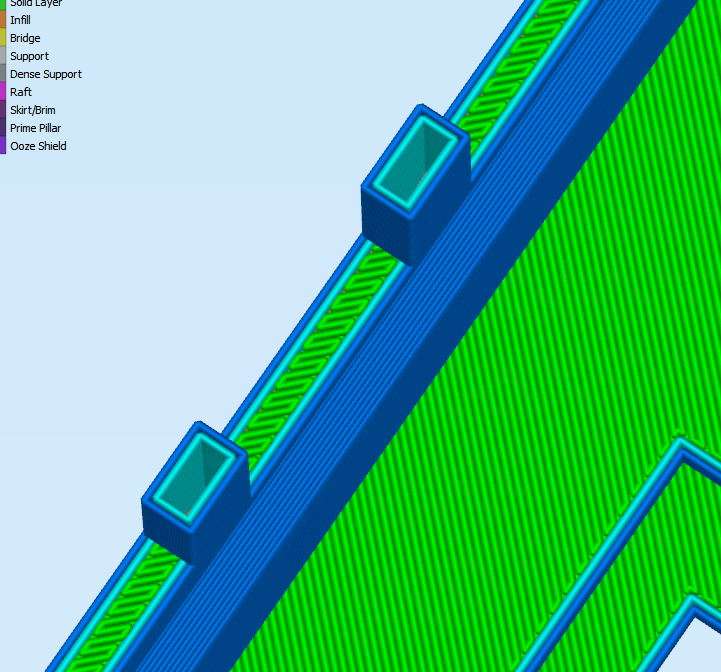 I found a way to make it solid on simplify3d, but it will also make everything solid after that wall starts at 14.29mm. I use 3 top and 3 bottom, but use 2 shells. I'm very new to 3d printing, but in my observation slicing software has a long way to go. Me having to set up things like "go slower for a layer under x seconds" instead of the software doing some thermal calculations. Or watching it do a pattern where it does one end, goes up to next layer and immediately does the same section rather then let that section cool slightly better and start somewhere else... I see lots of places where some math and heuristics could go a long way. I'll bet we'll see slicers just leaps and bounds in the future. But whose? I'm currently learning S3D, and have some nice output, but man, you do a lot of manual tweaking. Dark arts. Last edited by Paul Kierstead; 09-19-2016 at 11:17 AM. Yeah 2 shells of 0.4mm is not give the part any chance to have the strength it needs. 3 shells would be much stronger I'd imagine. The print with the little supports behind the pillars, it does fit the Pi, but I am concerned about making such a tight fit that there's not enough slop to allow for different 3D printers, or the Raspberry Pi connector not being soldered 100% straight. It does seem to make it a little stronger, but now it splits the layer at the bottom of the bumpout rather than snapping the post off entirely. I'm trying another version with the post going all the way top to bottom because I think that could transfer the force all the way to the bottom rather than having it create a stress point in the bumpout. Oops I forgot to hit POST and now there's only an hour left on the print so might as well just wait... seems about the same and it breaks at the same part, the part on the outside of the case where it starts to extend out. Still it doesn't hurt so I'll commit this change. 10k SMD resistor installed, all good now, thanks again. 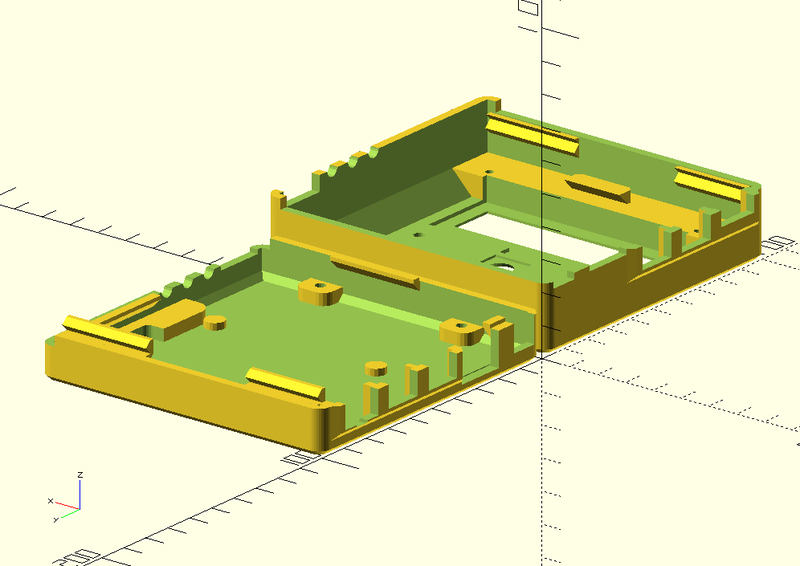 I've pushed a new .scad version of the case to Thingiverse and Github. This adds the USB reinforcing pillars and bead chamfer with the larger radius. I've also modified the case split to be 3.4mm lower at the probe edge vs the rest of the case so you can generate less torque on them which could also lead to snappage. I've also changed the interior a little so the edges slope in to the faces, so it creates a little more strength and also might have the side effect of reducing ABS warp. My thinking is that it provides more support to the upper layers, which is when the most warp tends to happen for me. Give that a try and see if it helps at all. Last edited by Bryan Mayland; 09-23-2016 at 11:22 AM.